Read about Shay's journey to self-love on page 14. Financial education speaker and author Shay Olivarria is featured in this month’s Finding Love Magazine. She talks about sticking out from her peers and being kind of … odd. Shay Olivarria is a wonderful, loving person. She’s run her own financial education business, Bigger Than Your Block, for five years. She’s earned an undergraduate degree and studied for a graduate degree. She’s traveled to nine countries on three continents. By every definition she’s accomplished, so why didn’t she love herself? Turn to page 14 and check out Shay’s article in Finding Love Magazine this month. I’m working through my issues. They are definitely not over yet, maybe they never will be. I’m better than I was, though and that’s all that matters to me. I’m still considered strange to most people I meet. I still have to give myself pep talks before I step on stage. My jokes still fall flat sometimes, but who cares? We’re all works in progress and right now I’m having a great time settling into myself. Just read this article in USA Today about young people that have graduated from college and are flying through life with little knowledge of personal finance. It doesn’t surprise me because this article just came out from Society of Human Resource Management (SHRM) that ranks each state in two categories: knowledge of personal finance concepts and application of those concepts in everyday life. 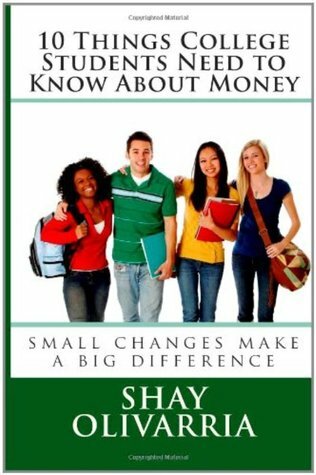 Buy a copy of 10 Things College Students Need to Know About Money for the student in your life. 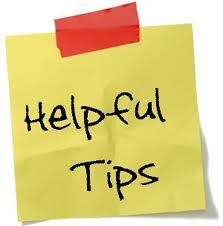 So what can parents do to help students learn about personal finance? Take advantage of teachable moments, attend events that reinforce financial education principles, and provide resources to help students understand personal finance concepts. 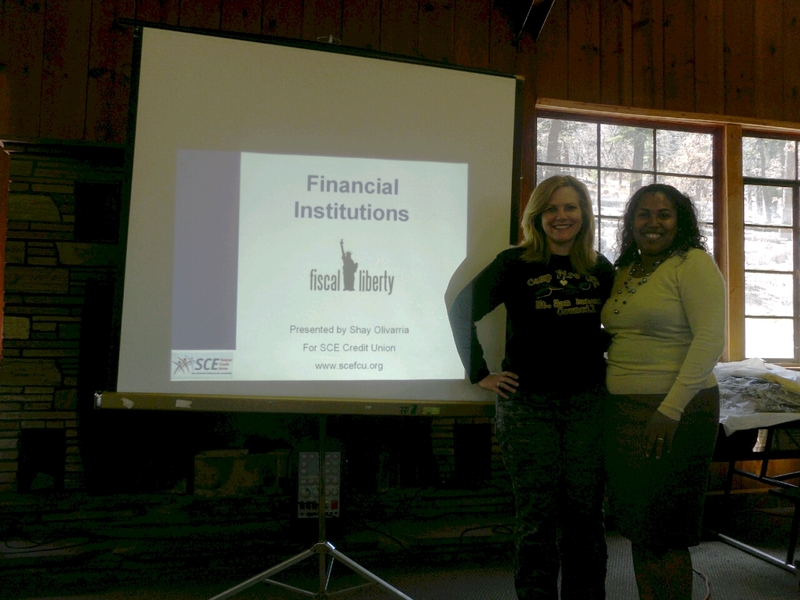 Camp Fire USA Executive Director/CEO Sandra Rutherford with SCE Federal Credit Union Foundation representative Shay Olivarria at Camp Miss Independent. Camp Miss Independent is a two-day event at Camp Nawakwa in the San Bernardino mountains. Students come up Friday night and and stay overnight until Sunday morning. Speakers cover personal finance, dressing for success,financial aid, and college life. Students were excited to receive a special offer from SCE FCU. 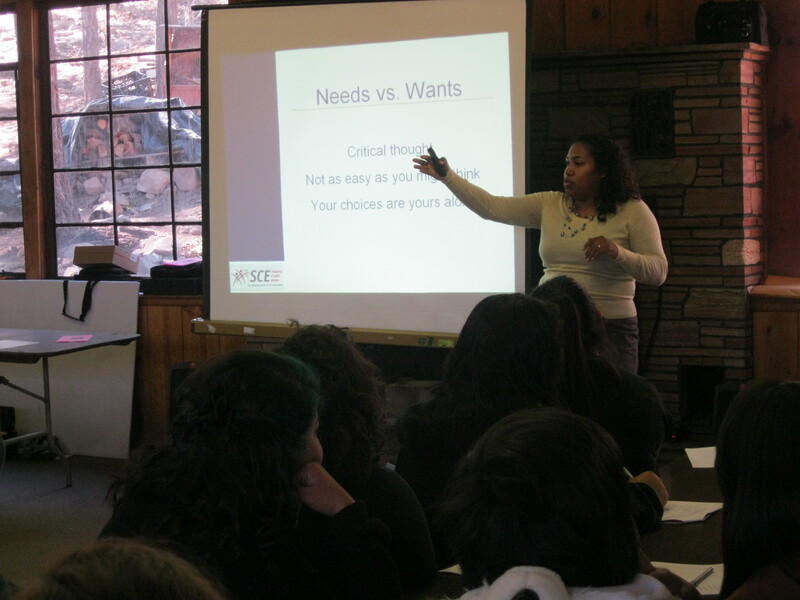 SCE Federal Credit Union Foundation representative Shay Olivarria facilitates a discussion the difference between credit unions and banks at Camp Miss Independent. I had a great time working with the students that attended Camp Miss Independent 2012! A southern California credit union. A great place to have a relationship. Click the photo to visit the SCE website. As you know, Shay Olivarria, has had a mutually beneficial relationship with the SCE Federal Credit Union Foundation for years, so you can imagine how happy she is to learn that 10 the students at Baldwin Park High School have finished in the top 20% of all the students that took the national financial education challenge! 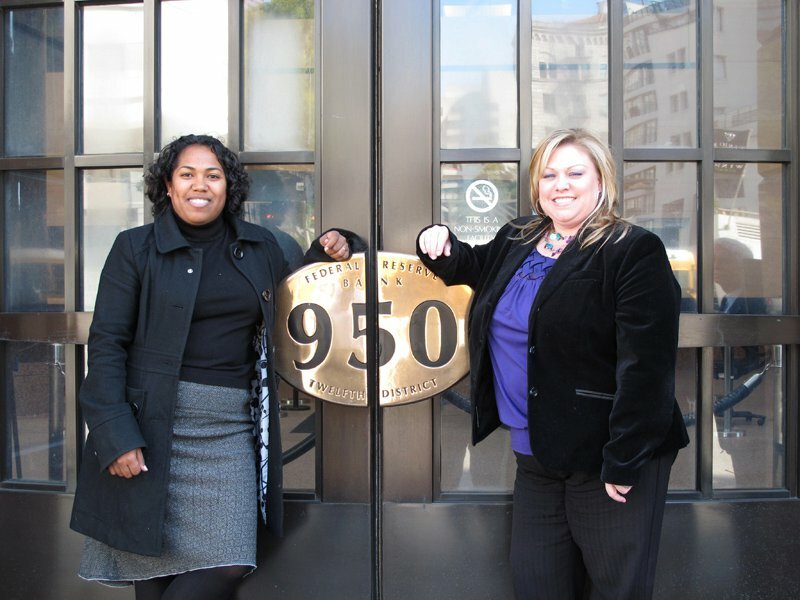 In 2011, 52 public schools in California competed in the competition and posted scores below the national average, which can be attributed to California high school students not being required to take a financial literacy course in order to graduate. Baldwin Park High School, which offers a financial literacy program with the help of SCE FCU’s Foundation, had 10 students finish in the Challenge’s top 20 percent nationally in 2011. Last year, SCE FCU partnered with Boyle Heights Technology Center and Watts Youth Opportunity Movement, two non-profits running a special youth workforce program for 14-21 year olds, to educate them on smart money management skills. More than 140 participants opened a special savings and checking account, which SCE FCU designed with safeguards to avoid overdraft fees as students learn to use their account. Here’s to another banner year with SCE Federal Credit Union Foundation! Here’s to making a difference every day with students across the country! This morning I read an article about UK-based financial institution Barclay’s bank rolling out yet another way to pay without opening your wallet and pulling out your debit, credit, or store card. It is one third of the size of a standard credit card, with a sticky reverse side. It will be sent without charge to customers who request it and will come in addition to their regular credit card. The credit card provider believes that people should stick it to the back of their mobile phone handset because most adults carry their phone with them at all times. Cardholders may choose to attach it to their wallet or a key ring, instead. 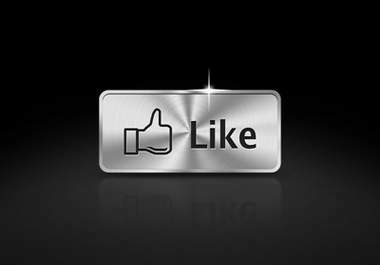 Are we ready for this kind of technology? I don’t think so. Not only do I think we’re not ready, I think that financial institutions know that we’re not ready and that’s why they want us to sign up for stuff like this…. so we’ll blow our money and end up paying fees to them. That sounds kind of conspiracy theory-ish doesn’t it? Well, just because it sounds like that doesn’t mean it’s not the truth. Originally there was a limit of £10 on wave-and-go purchases. That maximum level now stands at £15 and is set to increase to £20 in June. This is generally the kind of amount spent on debit cards, rather than credit cards, although Barclaycard is clearly encouraging customers to make more everyday purchases on a credit card. They really start to salivate at the potential marketing bonanza. Companies developing these services plan on packing loyalty cards, coupon folders, and Groupon-like deal-of-the-day offers right into the digital wallet. Retailers could build comprehensive profiles of their customers, targeting them with additional discounts and come-ons at the checkout terminal or when they’re out and about, in pretty much the same way Amazon and other online retailers track shoppers as they browse the Web. You know why they offer these deals? Because they know that not only will you make the original purchase, you’ll purchase a few more items because you got a discount. SMH They know what we don’t, that we’re too stupid to make good decisions when faced with “deals” and “convenience”.